Bask in sunrise views on the private balcony, or soak in a private Jacuzzi on the back patio of a beautiful, luxury townhouse in Eden, Utah. 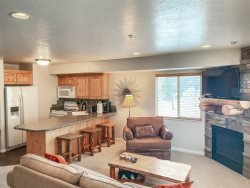 This townhouse is minutes away from Snowbasin Ski Resort, Nordic Valley, Powder Mountain Ski Resort, and Pineview Reservoir. Since the townhouse is located in Wolf Creek Resort, you can also take advantage of Moose Hollow Community Clubhouse amenities such as outdoor pool, Jacuzzi, game room, and gym; and the numerous walking paths around the properties. This luxurious 4-bedroom townhouse has two floors and over 2000 sq.ft. of space that includes a fully furnished kitchen, master suite, dining room that seats eight, sitting room/living room with a fireplace, media room, and game area that can be used for family fun. Everything has been hand-picked for your comfort and enjoyment. No other 4-Bedroom Townhouse offers more amenities and service options. In addition to the essentials, amenities chosen for you are free WiFi, bedside charging stations, gaming console hookups, four flat screen TVs with cable and/or streaming options, and coffee and tea selections. Service and assistance menus are also available. Welcome to Cascades 205, your luxury townhouse getaway! This townhouse is full of beautiful things, in a beautiful area, but we are here to focus on YOU. We want your vacation to BE a vacation.